Momma Told Me: You're sweeter than kisses. We've already established that my family has a history of saying 'I love you' though Hershey's Kisses chocolates. 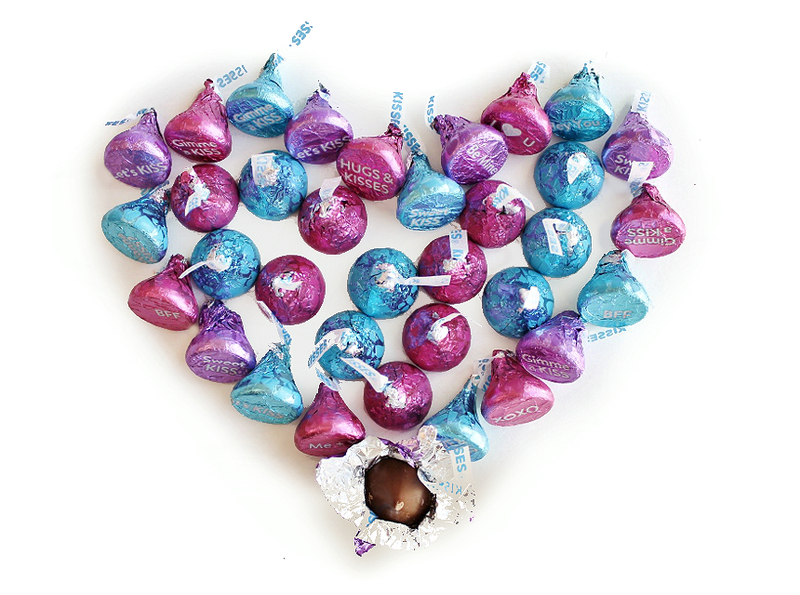 Whether it was my grandparents sending seasonal Hershey's Kisses clear across the country or my father and I pushing bedtime limits with an after dinner game of Chockers (the official Hershey's Kisses Checkers game,) I grew up with these little chocolate drops unwrapping a message of love. So it's absolutely delightful to me that this year, for Valentine's Day, Hershey's has released new Conversation Candies in Hershey's Kisses and Reese's Cups, exclusive to Target stores nationwide. 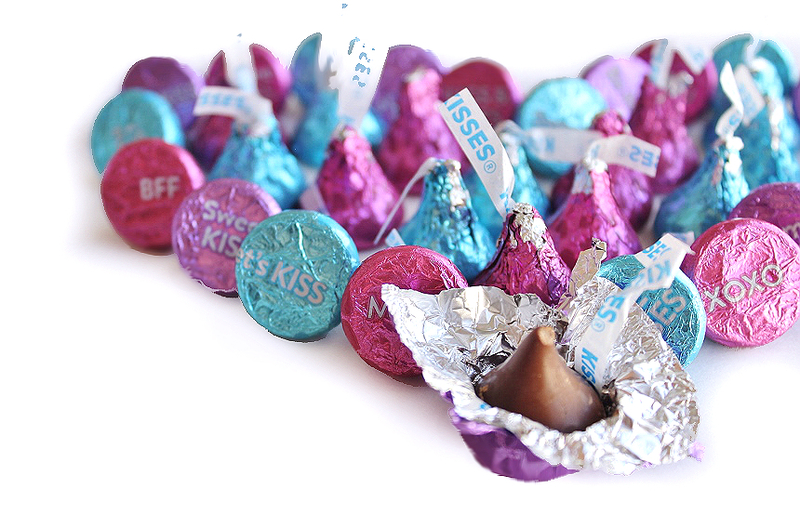 The limited edition Hershey's Kisses Conversation Candies feature an array of heart flecked pink, purple, and blue foil wrapped Milk Chocolate Kisses with sweet little messages printed on the bottom of the wrapper. There are at least 10 unique messages, I've counted, and they range from fun and flirty 'Let's Kiss' and "XOXO" to simply "BFF." Hershey's Conversation Kisses bring home the fun of traditional Valentine's conversation hearts without the chalky aftertaste; who doesn't love to enjoy a melt-in-your-mouth Hershey's Kisses? Of course my father, who has always maintained the only way chocolate can be made butter is with peanut butter, is a Reese's Peanut Butter Cups fan- so I have plenty of Reese's Conversation Cups on hand for Valentine's Day too. Unlike the Conversation Kisses, these special edition cups, also exclusively available at Target, have fun heart messages printed ON them- so you can unwrap a surprise with every cup. The wrappers also have the perfect writing space on top for a "To and From" label- they're literally ready to pass out this Valentine's Day. 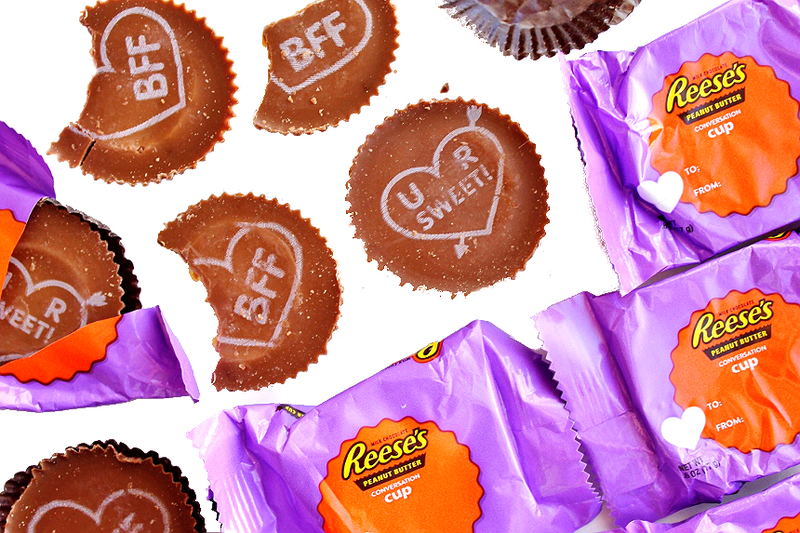 Really, what could be better than chocolate WITH conversation messages? Okay, there is something, maybe- I DID hit the personal lab and create something extra special for all of you, my Valentine's- too bad the delicious Hershey's chocolates don't transfer through the screen to your printer too! 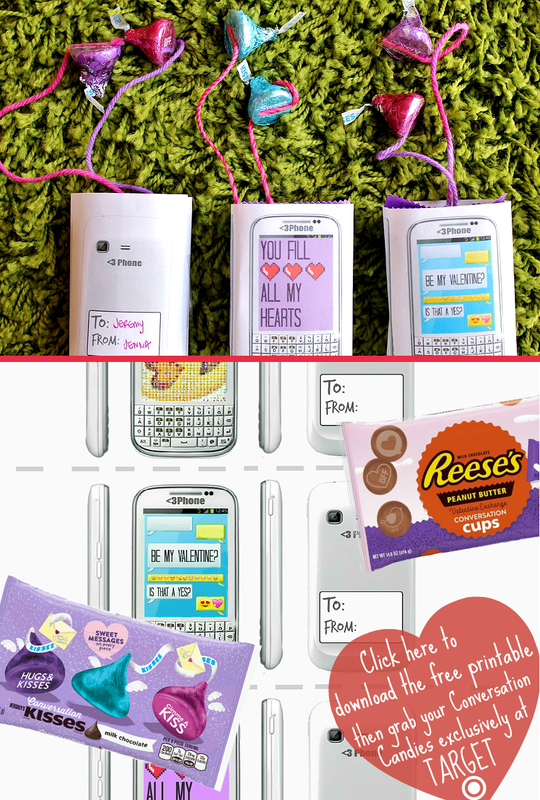 Inspired by our previous Nerd Love Hershey's Valentine's Basket theme, and D.I.Y Robot Box of Chocolates, I kept the techy love alive with some adorable printable Valentine's Day wrappers that transform a couple Reese's Conversation Cups and 2 Conversation Kisses into a sassy Smarty Phone Valentine! 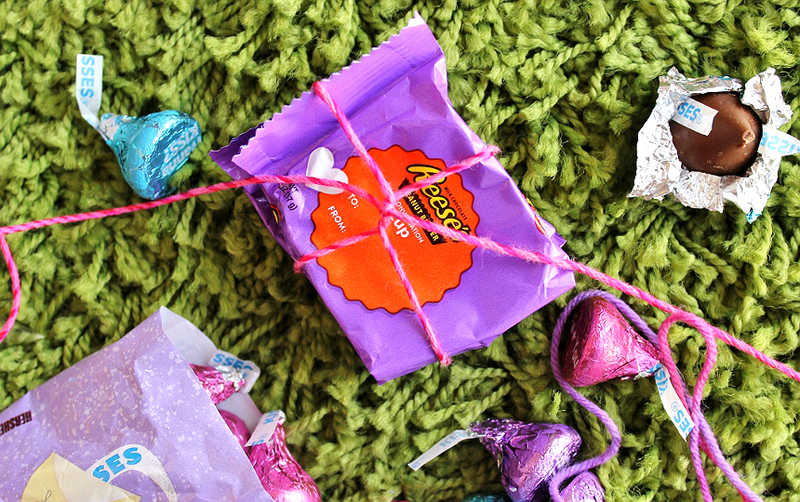 These are easy to make in seconds with the FREE Printable wrappers, featured below, and a little bit of colored yarn. You truly can spread the #HSYMessageofLove in no time! Obviously I still had my teenager (I can't believe I'm calling her a teen now!) 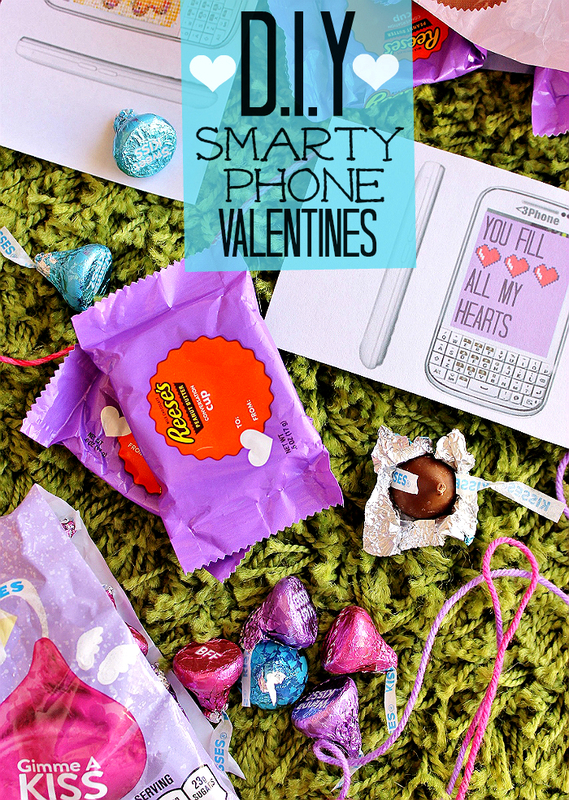 niece in mind when I made these colorful and playful Smarty Phone Valentine's, complete with delicious Hershey's Conversation Kisses earbuds. Because, what teenager or tween ISN'T plugged into their smartphone these days? Of course these fun Hershey's Conversation candies are sure to spark a few fun conversations between classmates or co-workers this holiday. Just be sure to remind them there's no warranty on those earbuds should one get eaten! My favorite thing about holidays, such as Valentine's Day is sharing the love and fun with friends and family. Pleasing tweens and teens can be tough- they never seem to want anything anyone else has. 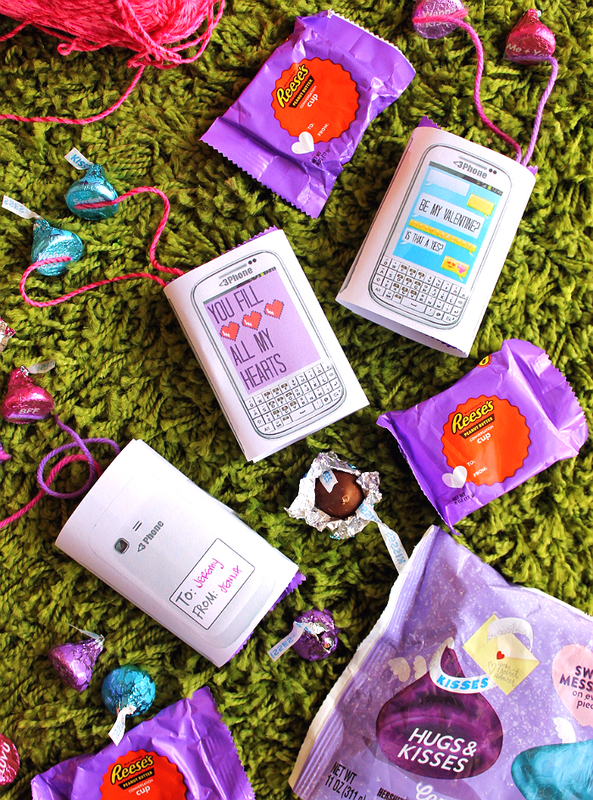 Go ahead and print out our Smarty Phone Valentine's Wrappers and let them have their say with hand picked Hershey's Conversation Candies from Target, each and every Smarty Phone is guaranteed to be unique! As for me, I'll be passing some of these Smarty Phones out to my league-mates next week at the alley! Be sure to get the FREE Smarty Phone wrapper printable and grab your Conversation Candies from Target. Now tell me, who in your life gets a Valentine every year? Are you a traditional cupid who only shares the day with your other half, or do you like to spread the love around with family and friends? For more #HSYMessageOfLove information, including recipes, visit CelebratewithHerhseys.com. 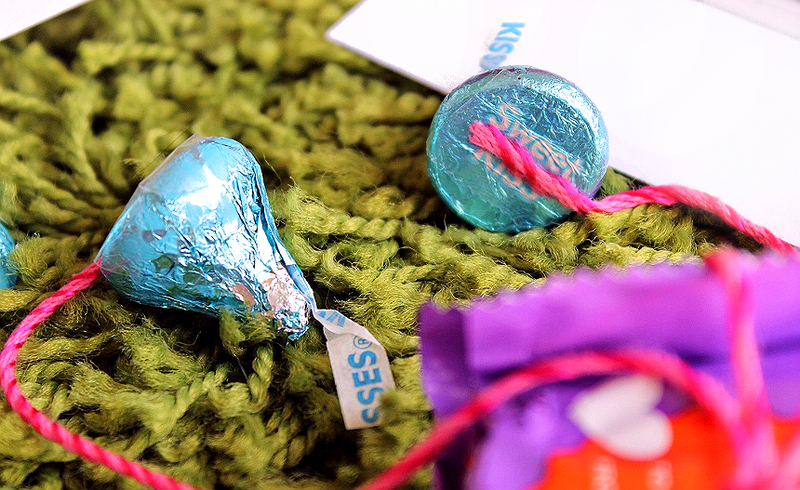 What Daughter Says: It's hard to out-sweet these kisses when they're made of delicious Hershey's Milk Chocolate! These are absolutely adorable valentines. I don't know that my daughter would want to give them away either because they contain her favorite chocolate treats. Oh my goodness! These are some of my favorite chocolates! I want them all! You are a world class photographer!! What a fun idea. These would definitely appeal to the tween crowd! You are so clever. These would be so cute for kids to pass out on Valentine's day. Although I would eat all of the Reese's before I got any made. They are my weakness. I didn't really understand the concept but as I scrolled through your article, I began to laugh at the conversation aspects of candies. How clever to couple them with the phone. I can see kids loving to receive these as valentine's from their friends. That's such a cute idea. I especially love the "You Fill All My Hearts" one. It's very Legend of Zelda 1986. These are adorable! I think that the cell phone idea is just genius, especially for teens. 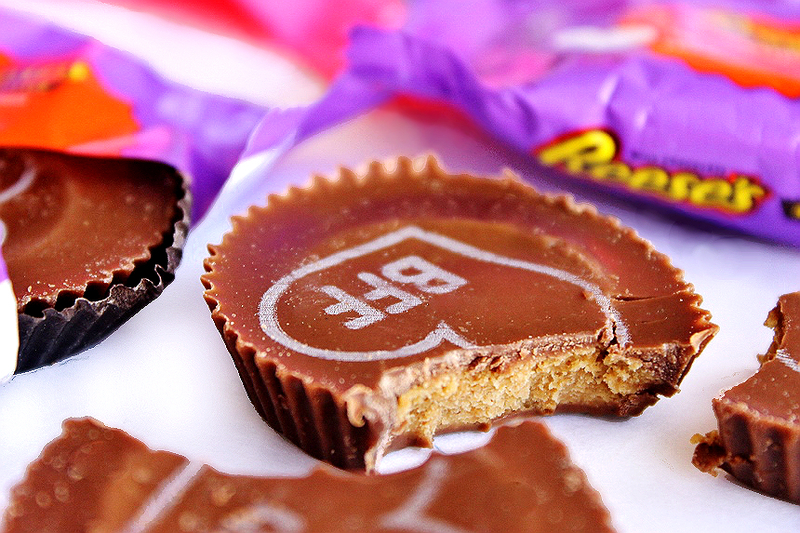 Few things in life are better than Reese's Peanut Butter Cups, except maybe Reese's Conversation Cups! I can not wait to buy some of them to share with my own little sweethearts! Those are really cute. The teens would seriously love them! What cute ideas... I had no idea that these were out. I can't believe that Valentine's is right around the corner. I need to find these as they would be perfect for the kids. Thanks for sharing.